Fueled by either flower-power or psychedelic drugs, an estimated 100,000 tie-dye-wearing, alternative-lifestyle-advocating, Vietnam-War-protesting, rock-and-rolling youths marched to the corner of Haight and Ashbury in San Francisco.It was 1967 – the Summer of Love. If the Summer of Love had a soundtrack, Scott McKenzie’s San Francisco would be the first track. The song - along with its now famous lyrics, “be sure to wear flowers in your hair” - was used to promote the Monterey International Pop Festival. Headlined by legends such The Jimi Hendrix Experience, Janis Joplin, Grateful Dead, The Who, Jefferson Airplane, The Mamas and the Papas, Otis Redding, The Animals, and Ravi Shankar, the now iconic three-day long music festival officially kicked-off the Summer of Love. And as the festival wound down, the thousands in attendance continued their counter-culture pilgrimage to what will soon become as the epicenter of hippie culture – Haight-Ashbury district, San Francisco. Although the Haight-Ashbury district is a very different scene now, fragments of the 60s hippie culture still peeks through the high-end boutiques, private schools, and even through a Ben & Jerry’s franchise. So, if you’re up for a very good – excuse the pun – trip, to re-live the era of free love, first, download this free app. The San Francisco Travel Guide and Offline City Maps SF has an augmented reality feature, offline metro maps, and suggested itineraries. To get you started on following the hippie trail, here are a few suggestions of historical and groovy places to visit in the Haight-Ashbury district from eTips. As one of the Haight-Ashbury originals and witness to the Summer of Love, there are plenty of reasons to stay at The Red Victorian. But mostly, who wouldn’t want to stay in hotel that’s rumoured to have been a brothel, hosts World Peace Conversations on Sundays, and have rooms named Summer of Love, Flower Children, Earth Charter, and Peacock? If only Haight’s Painted Ladies can talk. 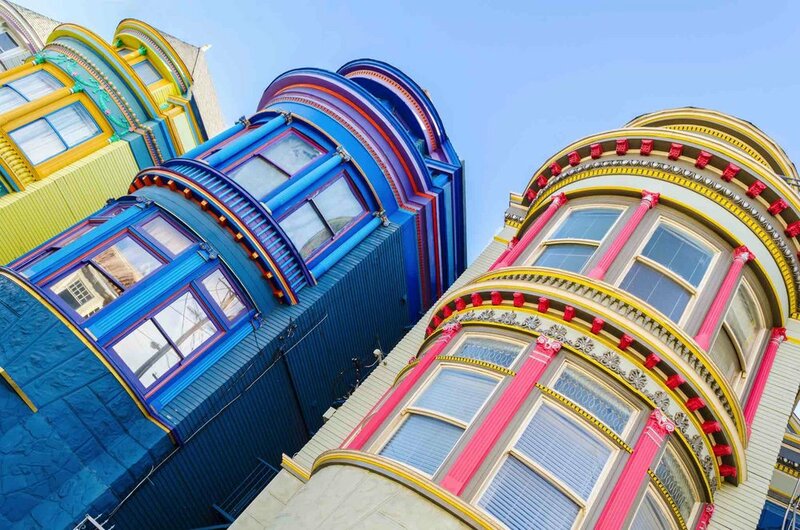 These intricately-designed Victorian and Edwardian houses that line up the district’s streets, were once home to such greats as Jimi Hendrix (1524A Haight St.), The Hell’s Angels (719 Ashbury St.), Grateful Dead (710 Ashbury), Janis Joplin (122 Lyon St.), and Sid Vicious (32 Delmar St.). Living up to its name (and history), Hippie Hill on the east end of Golden Gate Park hosts the annual 420 in the Park festival. Where thousands of visitors smoke up, listen to some drum circles, face paint, and most probably, satisfy their mid-day munchies. The festival isn’t exactly legal, so enjoy at your own discretion. But if you want a more law abiding happening, the Haight-Ashbury Street Fair is celebrated every year on the second Sunday of June. Nothing screams more of counter-culture symbol than a bookstore with "An Anarchist Collective" as its tag-line. The all volunteer-run, consensus-based shop sell zines and books that cover topics like feminism, queer culture, poetry, politics, drugs, spirituality, and, of course, Anarchism. While it wasn’t yet around during the Summer of Love, Amoeba Music is the portal to era’s record collection. True to its name as the world’s largest independent record store, it carries everything from vintage vinyl LPs to hard-to-find CDs, even cassettes. If you’re a music lover, better dedicate a whole day just for visiting the shop. Because with their quality stock of music and movies, you might not even make it to the new release aisle. What better souvenir from the home of the hippies than premier psychedelic fashion items? In true peace and love fashion, the boutique gives a portion of its profits to Taking It To The Streets San Francisco (TITTS), an organization that works with homeless youth.